I wasn’t named for blame in the Gomery Report. I received no Section 13 letter. So I guess if they can’t get you one way they try another. I am now one of ten people “banned for life” from the Liberal Party. A party that I am not even a member of. There is very little “liberal” about this Liberal administration. 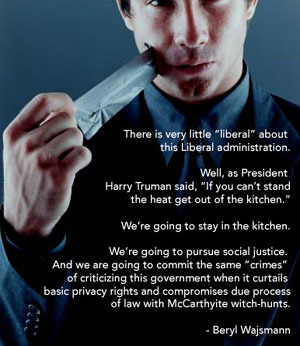 Well, as President Harry Truman said, “If you can’t stand the heat get out of the kitchen.” We’re going to stay in the kitchen. We’re going to pursue social justice. And we are going to commit the same “crimes” of criticizing this government when it curtails basic privacy rights and compromises due process of law with McCarthyite witch-hunts. It is time for Canadians to wake up to the near Stalinist statocratic government we have that can abridge the most basic freedom of a citizen in a free society. That of political affiliation and assembly. That is what this government has tried to do. It will fail. It will fail just as other governments have failed that have crossed the line and incurred the people’s wrath. Nixon had his “enemies list”. We now have a Canadian Nixon. Canadians need to ask the same question of this government because there are even greater dangers to civil liberties lurking around the corner. At an Institute conference a Member of Parliament once characterized Canada as a “controlled democracy”. Today, Canada may well be on the road to becoming a terrorizing democracy institutionalizing a culture of victimization and fear. Over the past few weeks the federal government has announced that it will proceed with several initiatives that to this writer put the lie to the image of a just and transparent society we like to peddle to the world. Next month the Martin government will bring forward legislation allowing for the monitoring of e-mail and internet communications. The bill would force providers of internet and telephone services to duplicate records of their clients’ activities and require, on simple request, that the information be passed on to police authorities. The proposal demands that network capacity be constructed to allow for tapping of some 8,000 individuals at any one time. Federal Privacy Commissioner Jennifer Stoddart has told Justice Minister Irwin Cotler that the law would allow security authorities to access more information about Canadians’ personal lives than ever before. Yet Ottawa remains strangely silent on consideration of any judicial safeguards and oversight even in light of the fact that current evidentiary requirements for standard wiretaps have already become flimsy and shallow. The federal Liberals have also gone on record as being committed to proceeding with Bill C-17, the Marijuana Decriminalization legislation, and with Bill C-53, the Proceeds of Crime act. Though legalization, not just decriminalization, of marijuana is long overdue, the problem of C-17 is that it also allows for random stopping of motorists to check for drugs without any necessity of probable cause as exists in the United States. C-53, which seeks to allow the government to seize any assets obtained through illegal means, also has within it the reversal of burden of proof. Unlike even the RICO statute in the U.S. or the “Guerin” law in Ireland, the Proceeds of Crime Bill would make certain accused guilty until proven innocent turning hundreds of years of civil liberties protections on its head. The new initiatives announced by Ottawa follow in the wake of the giant databases being created by the CCRA which has repeatedly refused to limit its use to anti-terrorism measures as requested by Canada’s privacy commissioner and civil-rights advocates such as former solicitor-general Warren Allmand. They follow in the wake of current Canadian Security Establishment monitoring of some 25% of all land line calls and 50% of cell calls with some 20% of these being sent to the National Security Agency in Washington for transcription. They follow in the wake of the forthcoming biometric national identity cards. They follow in the wake of the proposal to put electronic security anklets on suspects who have not even been charged. And finally, they follow in the wake of the government looking at empowering a host of regulatory functions to be made by Order-In- Council without the approval or consent of Parliament. It is time to turn the timidity of Canadians around. A timidity that has led to obsequious obedience when Federal Ministers corrode a citizen’s reputation in open pronouncements; when the RCMP raids a reporter’s home in violation of a judge’s order; when Revenue departments compromise longstanding privacy protections on taxpayers files through information exchange with other departments and other levels of government; when CRTC judgments decide what words we are allowed to hear and what images we are allowed to see. All these matters, if allowed to go unchallenged, will set precedents that will open the door to practices that exist in other societies where state authorities routinely compromise anyone of interest on any pretext. And these issues cannot just be the subject of court challenges. They take too long and damage done cannot be undone. They need to be challenged with the full panoply of weapons including the law, the media and a vigorous public advocacy that threatens to expose what the 18th century legal philosopher Becarria called “… this tyranny of the mindless…” and arrest this triumphant march of the mediocre. Ottawa must be made to recognize the inherent right of every citizen to an equal claim of presumptive tolerance from the state. That each member of a free society has as a birthright, in Lord Acton’s words, to the “…equity of just consideration…”. This government has been systematically abrogating that birthright. Law cannot be continually used, and abused, as a two-edged sword of craft and oppression. It must become the staff of the honest and the shield of the innocent. Elected officials cannot be allowed to marginalize its citizens without restraint of consequence. We are a society of laws and not of men. But when bad men make bad laws, or when unprincipled officials compromise good ones, then it is time, as Gandhi said, to stand up and exercise “responsible agitation” to stop governments from “…staggering drunkenly from wrong to wrong in order to protect their own immortality…” Let us never become so falsely pious that we forget that today’s laws are merely the limits on our actions placed by those in power who profited from a yesteryear when these laws did not exist, and now seek to protect their own gains by limiting access for others. The heart of the matter is whether we can afford to sit idly by while this nation continues the restriction and reversion of rights that has been it’s hallmark over the past several decades, or whether we will chart a return to the proper course for this land, that of meeting a liberal democracy’s primordial obligation of protecting and expanding the amount of liberty and dignity which all human beings have a right to expect. It is clear why the United Nations named Canada as one of the most invasive and intrusive governments in the liberal west. It is high time to tell the statocratic control freaks on the Rideau that enough is enough.